Sherri L. Smith's newest book is based on The Nutcracker. Taking on a classic story is always interesting and I love knowing how authors research and make a well known story their own, so I wanted to know more about the research process for The Toymaker's Apprentice. Most people don’t realize that the Nutcracker ballet has its origins in an E.T.A. Hoffman story, Nussknacker und Mausekönig published in 1816. Some thirty years later, Hoffman’s strange story caught the imagination of Alexandre Dumas—the man who wrote The Three Musketeers and other popular novels. It was Dumas’ version that Tchiakovsky based his ballet upon. Luckily for me, as a kid, I fell in love with both the Hoffman story and the ballet. As an adult, I found myself still daydreaming about the mysterious godfather Drosselmeyer, and the story behind the story. So it wasn’t much of a stretch to think that one day I would tackle those questions for myself. In my office is a blue binder stuffed to the gills with indexed pages: 18th Century Clothing. Asia. Turkey. Arabic Cooking. Clockmaking. Nuts. You name it. When I finally decided to tackle this book, I amassed so much information that the novel sank. It disappeared from view under the weight of too many possibilities, which took me ten years to assimilate and resurface with a story worth telling. It’s a strange thing when you are a writer. The book the world sees is only one version of a multiverse of books I’ve written or imagined, all a different variation on the same story. The version of Toymaker that you will read took several passes of research. From that initial binder (I even recruited my mother into researching various time periods for me) to the last round of spelunking into the history and politics of 1815 Europe, and toy and clockmaking of the period, I did as much research as I could from libraries and a laptop in California. I read up on lifespans of the various animals in the books, and the land speed of mice versus humans. How to crack nuts. Christmas traditions in Nuremberg. I could give you a long list and sound like Bubba from Forrest Gump talking about shrimp. The idea is, you find out as much as you can, set it in the back of your mind, and then tell the story. I find my brain will pull out the supporting details it needs to keep the story alive and moving forward. Because of this method, which is rather like sifting for gold, I am always researching stories whenever I read or learn about something new. I remember in patting myself on the back one day for inventing catacombs beneath the city of Nuremberg that worked perfectly for my story. Then I went back and looked at my notes. There are catacombs! And they still work as if I made them myself! The best news for all us struggling writers out there is, if you’re midstream in a story and can’t come up with a good idea based on what you know, it doesn’t mean the story doesn’t work. You just need to do more research. 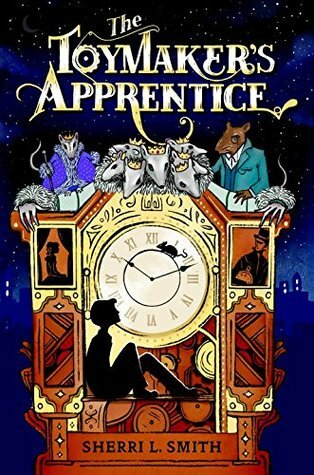 About the Book: (from Goodreads) Stefan Drosselmeyer is a reluctant apprentice to his toymaker father until the day his world is turned upside down. His father is kidnapped and Stefan is enlisted by his mysterious cousin, Christian Drosselmeyer, to find a mythical nut to save a princess who has been turned into a wooden doll. Embarking on a wild adventure through Germany, Stefan must save Boldavia’s princess and his own father from the fanatical Mouse Queen and her seven-headed Mouse Prince, both of whom have sworn to destroy the Drosselmeyer family. Thanks for having me, Sarah! It was fun to share some of the behind the scenes stuff that no one gets to hear about!